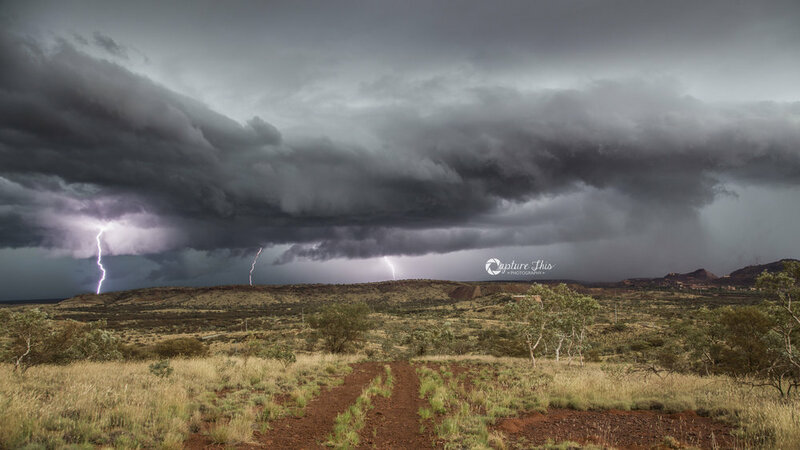 Cloud ban from a recent cyclone that hit the Pilbara coast. Newman put on a good show for 2016's Australia day! Can't go camping without having a camp fire!! Haul truck at the entrance of Newman W.A. Love watching a good sunset especially when it puts on good colours like this one! Lucky shot down the bottom of Mt Newman while watching a storm roll in. 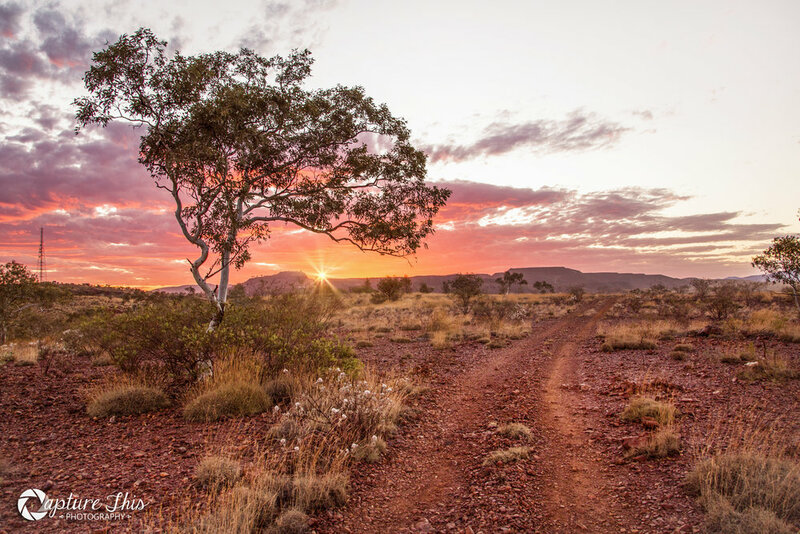 I love watching the sun go down in the Pilbara and you can't get a more peaceful spot than this. The best part is, It's right across the road from me! On the way home from the shop my husband tells me he thinks the 'clouds will look awesome in about half n hour'. So up Radio Hill we went to watch the storm come in and it was a magical sight. Everything Pilbara all in one. We managed to capture a few lightning bolts but this one is my favourite. There were different formations in every direction on the day. I had no idea where to look and shoot so I ended up setting both camera in different spots so I wouldn't miss anything! Went out exploring for new photo spots and came across this guy just hanging around. So obviously this is the spot we stopped and he let me get a quick snap before running off. cant beat a great fireworks show at the end of another great Fortescue Gestival weekend! Bush bashing and waterholes… The best way to spend an arvo in the Pilbara! This is one of the amazing crossings on the way to Kalgans. This spot itself is a great spot to park up for the day to. The beautiful Mulla Mulla over looking Opthalmia Dam in Newman. I was finished and packed up for the night when I thought I just needed one more shot… because my tripod was already packed up I ended up sitting down on the ground and sat my camera Gai at my foot<held my breath and hoped for the best. I was very happy I decided to get that one last shot because this is exactly what I had in mind. A beautiful dark cold night under the Fortescue Rive bridge in Newman. Although this night was so dark the stars lit up like no other night I have ever seen. I only got 3 photos this night because i was freezing and sinking in the soft sand under the water. Not a bad outcome in the end. 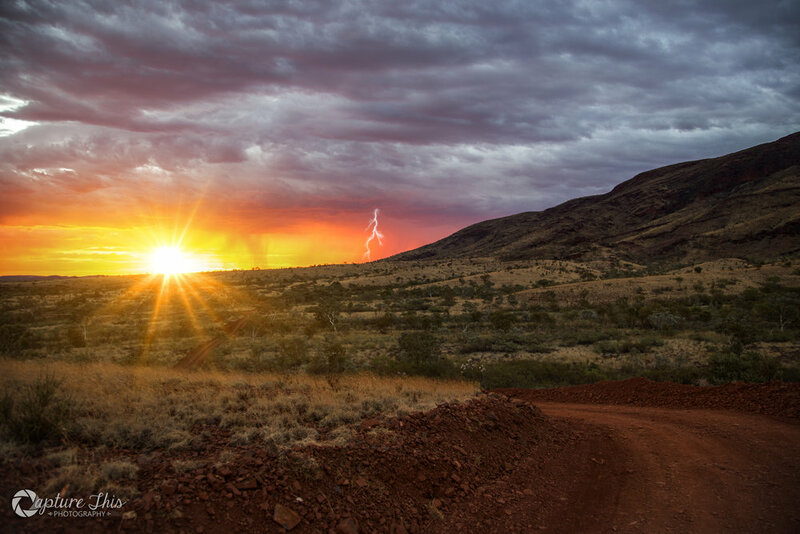 Summer nights in the Pilbara don’t get much better than this! This was a fire caused by lightning the night before and being danced around by lightning again. Was amazing to see the sky light up with so much light and colour. I was all curled up on the couch for an early night when my friend called and said ‘did you know the river is flowing?’. I looked out the window and seen some beautiful clouds so obviously I had to go out (in my pjs!) and get a quick photo. I couldn’t go far and really did not like where I ended up. The back drop was just horrible so I decided to pick a cute tree and get low! I like this perspective and gave by eliminating that horrible back drop it make this tree stand out proud amongst the grass.